Tomorrow is our 5th annual Whisky on the Hudson – NY Whisky Tasting and Dinner Cruise. Here is the pour list for tomorrow night’s festivities! The U.S. Senate signed “Bourbon Heritage Month” into law in 2007, a bill that reinforces the 1964 Act of Congress that declared bourbon “America’s Native Spirit” by celebrating the family heritage, tradition and deep-rooted legacy that the bourbon industry contributes to the United States. 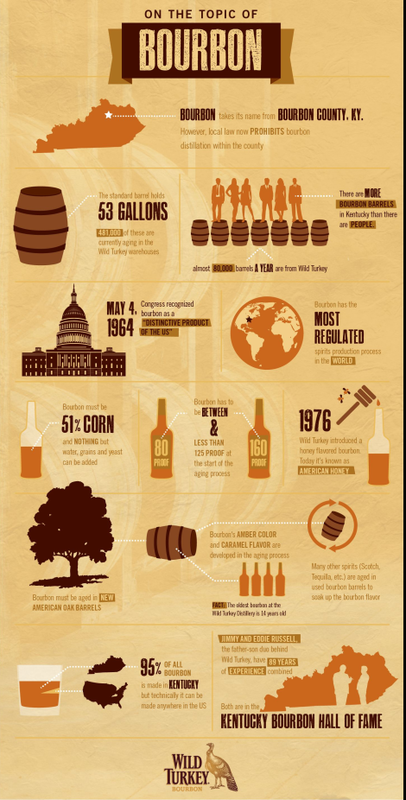 Here are 10 Interesting Facts about Bourbon. Bourbon takes its name from BOURBON COUNTY, KENTUCKY. However, local law now PROHIBITS bourbon distillation within the county. The standard barrel holds 53 gallons. 481,000 of these are currently aging in the Wild Turkey warehouse. There are more BOURBON BARRELS in Kentucky than there are PEOPLE. Bourbon must be 51% CORN and NOTHING but WATER, GRAINS and YEAST can be added. Bourbon has to be between 80 proof and 160 proof, and less than 125 proof at the start of the distillation process. Bourbon has the most regulated spirits production process in the World. Bourbon must be aged in NEW American Oak barrels. Many other spirits (Scotch, etc.) are aged in used bourbon barrels to soak up the bourbon flavor. 95% of all bourbon is made in Kentucky, but technically it can be made anywhere in the U.S.
Jimmy and Eddie Russell, the father-son duo behind Wild Turkey, have 89 years of experience combined. Both are in the Kentucky Bourbon Hall of Fame.